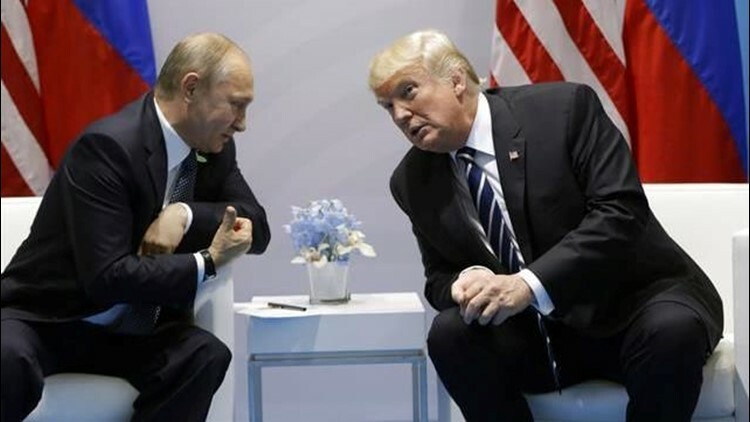 President Donald Trump voiced optimism that there are "very positive things" in store for the United States and Russia as he sat down with President Vladimir Putin for an historic first meeting. HAMBURG, Germany (AP) — President Donald Trump voiced optimism that there are "very positive things" in store for the United States and Russia as he sat down with President Vladimir Putin for an historic first meeting. Seated next to Putin on the sidelines of an economic summit in Germany, Trump said it was "an honor" to be with Putin. As journalists were briefly allowed in to witness part of the meeting, Trump said that he and Putin had already held "very, very good talks." "We look forward to a lot of very positive things happening for Russia and the United States," Trump said. Trump offered no details about what issues he and the Russian leader had discussed, describing them only as "various things." Putin was similarly vague, telling reporters through a translator that they were discussing international problems and bilateral issues. Still, Putin described the fact that they were meeting as a positive sign in itself. "Phone conversation is never enough," Putin said. He said he hoped the meeting would "yield positive results." With Secretary of State Rex Tillerson at his side, Trump sat in front of an American flag with his hands clasped together in triangle formation. Putin, slightly hunched in his chair, rubbed his fingers together as he listened to Trump address reporters. His foreign minister, Sergey Lavrov, sat nearby. The highly anticipated meeting is the first between Trump and Putin, taking place under the shadow of U.S. outrage about Russian election-meddling and nagging questions about potential Trump campaign collusion. The White House had said there was no set agenda for the session, although Tillerson said the Syria war would be a key topic.